MAVWC VOLKSFEST 2016 will be our 23rd year!! Hosted by UMANSKY 1400 W. Silver Spring. The Milwaukee Area Volkswagen Club is a not for profit organization of Volkswagen enthusiasts. 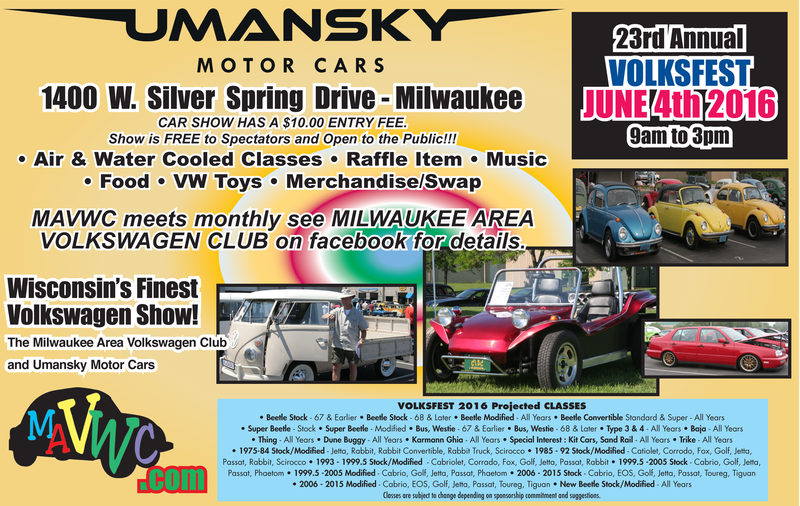 VOLKSFEST, our annual show, which will be on June 4th, 2016 is a one-day car show. We are projecting 23 classes with 1st, 2nd and 3rd place trophies in each class! Admission is free for spectators while registration for car exhibitors is $10 per vehicle. Proceeds benefit the Children’s Hospital of Wisconsin & the Cancer Foundation. The show includes raffles, music & food.